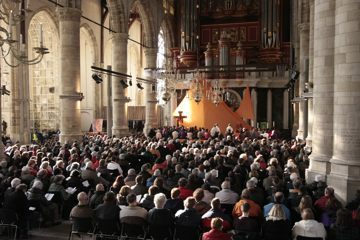 Sunday 16 January, more than a thousand people gathered at the Laurenskerk, the largest church in Rotterdam, for a prayer of thanksgiving for the pilgrimage of trust in the Netherlands. Joy and gratitude for this beautiful European meeting were clearly visible on their faces. The brothers thanked the authorities for their collaboration, the Churches and all those who helped prepare this event, as well as the thousands of people who welcomed the participants into their homes. Special mention was made of the local steering-group, which helped the brothers in the central organization of the meeting. The presence of thirty thousand young people in Rotterdam for five days left seeds of trust, and also of joy, compassion and forgiveness: three words that were written in large letters in the Sportpaleis of Ahoy and characterize the Letter from Chile. Each person was asked to nurture these seeds and to continue the pilgrimage of trust in their personal life, with their family and their Church. The multiplication of the loaves, a miracle that keeps happening. Twice the evangelists tell us about it, twice a miracle of bread. Twice about sharing, twice about multiplying. Jesus did not come to reduce but to increase, not for impoverishment but for enrichment, not for lack but for abundance. He came to share bread. And since bread alone does not satisfy, he shared himself. This bread has fed much more than 5000 lives up to the present day, and it is still not running out. This bread has to be shared. There is a core community that shares the bread, a community called together for that purpose. Without this core community it does not work. We received the Taizé brothers, together with the sisters of Saint Andrew. It is just like with the disciples: the Taizé Community has never counted on great crowds, and was initially a bit intimidated by the command: "Give them to eat." In the Kingdom of God, things happen to us. The question is whether we want them to happen. Over the years, many have been involved in the ministry of Taizé on a temporary basis as fellow-stewards, around a praying community. The same was true for the European Meeting; we are thankful for all those helping hands. Helping hands, sharing hands. Volunteers from Taizé, but also the many volunteers from the churches and even others from outside the churches. They all heard the commandment of Jesus: give them to eat. At the center is the crowd, the multitude, as they were called in the older translations. Where did they come from? We do not know. Luke speaks of 5000. We too have seen the 5000, multiplied four, five six times. What inspired them? From Ukraine, Albania, Poland, France, the Netherlands? We do not know, just as we know nothing of the people in the gospel. Yet we received them. We witnessed the miracle. It is the miracle of Jesus, the Risen Lord, the silent center of everything we do, the silent center of Taizé on the Meuse. Twelve baskets were left over. Taizé in the Ahoy is over, but we are called to manage the “surplus”. To do something with it. The party is over but the legacy remains. In this way the miracle continues. That is what we will dedicate our energies to, in the time to come. Twelve baskets, certainly enough for the next twelve months. First of all, for the Churches in our country, especially in our diocese: an impulse to continue and to animate the dialogue with the younger generation about the meaning of life, and to strengthen faith, in pastoral initiatives of prayer and reflection, meeting and community, service and solidarity. In the host families, these initiatives already became visible during the European Meeting. We hope that this will continue and expand in our diocese. Subsequently, the joint preparation and supervision of the European Meeting by inviting the Churches, the Protestant Church in the Netherlands and the Dutch Bishops Conference with support from the Council of Churches, has become an important stimulus for the ecumenical movement in our country. This has had a positive impact and will continue in other projects regarding the common call and mission to testify to Christ and His Gospel in Western society. Finally, the European meeting was a contribution to the process of unification in Europe. Across all boundaries of language and culture, national identity and history, young people found each other and reinforced an awareness of the human and humanizing values that underlie a united Europe, finding their confirmation and intensification in the Gospel. The encounter with Taizé has made young people aware of the co-responsibility of Europe for peace and justice worldwide, now and for future generations. Rightly. Brother Alois in his preaching made a connection with countries such as Haiti, which have major problems. After the bishop, three young persons shared stories about their experiences in this pilgrimage of trust before, during and after the meeting. Those responsible for the pastoral care of young Catholics and Protestants in the Netherlands gave the final testimony, speaking of their joy to have worked together on this project. They stressed that previously they did not even know one another and that this collaboration will surely continue and grow. For me, this event exceeded my expectations. I received what I asked God for in prayer, and even more. It helped me understand who I am. I realized how much I matter for God. I wanted to build my identity, to grow in self-confidence with respect to what I do, to the number of my friends, to my success in work and in life. At one point I had it all, yet something was still missing. As someone told me before the meeting, “You can only build confidence in yourself on God.” I understood that God is the only love; trying to live without him is like looking for a path to nowhere; all you do is get exhausted. Accept what is given to you even if it is a cross in your life. God will help you get through your difficulties and carry your cross; you are not alone. This can be a path of joy and happiness. I have been a volunteer in Taize since March 2010 and helped to prepare the European meeting in Rotterdam from the end of September on. When I arrived in Rotterdam in late September with an international group of eleven other volunteers, four Taizé brothers and three sisters of St. Andrew, I had no idea what to expect. The only thing I thought was: Wow, how incredible to live this together and to work together towards our goal for the end of December. Everything we are doing will be for that four days when Rotterdam will be full of young people. To be honest I was very sceptical about my own country. Sceptical about the hospitality, the openness of the people, the situation of the churches, the young people, and also sceptical about myself living with God in a country where I was not able to do that for many years. Or maybe instead of sceptical I should use the word “afraid”. My country has a tendency towards a more individualistic society, one which is more materialistic, secularized and achievement based. It is a tendency which can be observed for many countries. The Netherlands is a country which is known for its open-mindedness. But is there also an open-heartedness? During the months we were preparing the meeting I met a lot of people. I discovered my own country in a completely different way —discovered many things. After a few weeks I realized that, and it may sound strange, the European meeting is not at all about the meeting itself. Of course it is wonderful that so many thousands of young people come from all over the world to meet each other, to discover a new country, to get to know the people who live there, to sing together, to be silent together, to pray together, and to share with each other both about beautiful things in life and about struggles and essential life questions. Of course all of this is beautiful. But why cannot we just organize such a meeting in Taize itself? Why in the middle of a big city, why put so much energy and effort into trying to find host families for everyone? Why ask so many churches that don’t know Taize at all to organize prayers and a programme in their church, even if they don’t have any young people at all in their church? Why ask people from the local churches to meet every week or every second week when their diary is already exploding with appointments? Why....? I discovered that in fact the European meeting is not a goal at all, but it is a bridge. A bridge between churches of different denominations, where often they worked together for the first time. A bridge between young and old, with a real task to work on together and giving each other space for who they are. A bridge between church and neighbourhood: the churches needed to look outside their own circle to look for host families and for signs of hope, they needed to discover where they live. A bridge between church and society: there were many positive reactions in the media, in the city of Rotterdam and throughout the Netherlands. In addition many non-Christians welcomed participants and joined in the meeting in various ways. In a word, it is a bridge between people. Between people among each other and between people and God. For people to see that such a meeting is possible in our modern society is a big sign of hope which gives courage and trust for the future of society to very many people, as well as for their own personal lives. It makes it possible to see that a life with God is a choice that all of us can make in our life, wherever, whenever and with whoever we are. We can choose to live from our heart and we are never alone in that!